Catalog | Bernie Siegel M.D. 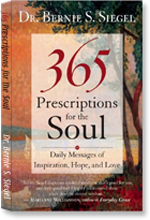 In this follow-up to 365 Prescriptions for the Soul, Dr. Bernie Siegel uses his trademark humor and insight to guide readers toward self-healing and an inspired life. He presents himself as a workout coach, providing a coach’s wisdom and stressing the coach’s mantra of practice, practice, practice. Each chapter consists of a coaching tip (where he explains the chapter’s teaching) followed by four or five exercises designed to bring the teaching directly into the reader’s life. The exercises are all short and easy to apply. Each of the 20 chapters covers a different topic, such as overcoming obstacles, creating a positive mental attitude, building a stronger spiritual foundation, and cultivating a sense of empowerment. 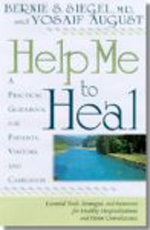 Throughout the book, as always, Dr. Siegel emphasizes a proactive approach to self-healing. 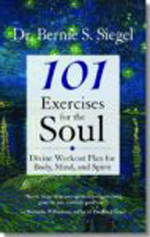 An ideal gift for friends and loved ones, 101 Exercises for the Soul shows how anyone can infuse their life with love and well-being. 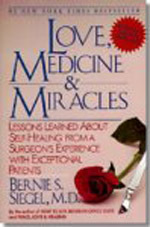 Bernie Siegel first wrote about miracles when he was a practicing surgeon and founded Exceptional Cancer Patients, a groundbreaking synthesis of group, individual, dream, and art therapy that provided patients with a “carefrontation.” Compiled during his more than thirty years of practice, speaking, and teaching, the stories in these pages are riveting, warm, and belief expanding. The courage to live and embrace love may make the difference between living and dying. In this exhilarating dialogue, Siegel displays a remarkable reliance on the natural capacity of people to manifest self-healing. He speaks of music in the operating room, inner guides and love as the principal force for healing. Siegel is a veritable Pied Piper for well-being, and he points the way to miracles as an everyday occurrence. Bernie Siegel broke new ground with his monumental book Love, Medicine, and Miracles, in which he explored the powerful role the mind can play in fighting illness. Sharing stories of seriously ill patients who survived against the odds and those who seemed to give in to their own deaths, the book inspired countless readers to consider the possibilities of thinking themselves well. Siegel believed–and still does–that the power to heal comes from the human mind through will, determination, and love. Over the last 20 years, his philosophy and advice have led many physicians and other healthcare professionals to help patients participate in and influence their own recovery. Many readers of Love, Medicine, and Miracles have wondered what comes next. What happened to patients who followed Siegel's advice? 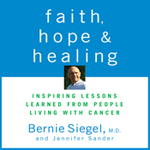 In Faith, Hope, and Healing, Siegel shares the inspiring stories of people who have experienced cancer and found deeper faith, hope, joy, and healing through the process. 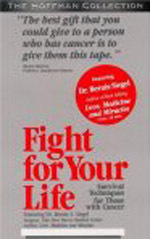 Grouped into sections on faith, hope, and healing, these stories and Siegel's insightful commentaries will encourage and help readers to develop an attitude and personality that survivors share, while also offering myriad ways to get through difficult times and discover the gifts that illness can bring into a person's life. In this book, Siegel reveals what these people's experiences tell us about our common strengths and humanity and how to live an authentic, fulfilling life. In his monumental best seller, Love, Medicine, and Miracles, Dr. Bernie Siegel broke new ground by revealing the powerful role the mind can play in fighting illness. His dramatic stories of seriously ill patients whose sheer will, determination, and love helped them survive against the odds inspired countless listeners to consider the possibility of participating in their own healing. This new companion audio to Dr. Siegel’s timeless classic takes the journey further. Finding Your True Self is wonderful CD that is full of positive affirmations. 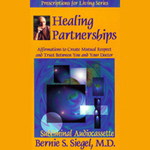 Throughout this CD Dr. Bernie Siegel guides you through a series of positive statements spoken as audible and subliminal affirmations to help attain and maintain a feeling of well-being. You can develop a deep sense of inner peace and wisdom, while listening to these positive statements on this one CD. Scientific Studies have proven that this is an easy and effective way to overcome mental hurdles and give yourself more health and happiness all throughout you whole life. In Getting Ready, Dr. Bernie Siegel guides you through a series of visualization exercises and inner journeys to help you to mentally prepare yourself for medical procedures such as surgery or chemotherapy. This CD can help to enhance your treatments so that you get more of a positive affect out of it. This can also help you to relax and focus. In this CD Bernie also explains how your desire and intention truly affect the physical world. This CD can help you to change your attitude, your thoughts, and your perceptions to more positive ones to help you to heal. With the correct positive attitude, you can make your treatment day a day of rebirth! Format / media: 2 CDs, Audio length: 89 min. Dr. Bernie Siegel guides you through a series of positive statements spoken as audible and subliminal affirmations to help you attain a feeling of well-being. Introducing affirmations to your conscious self may at first generate resistance. You may find yourself thinking, “This just isn’t so. This is just wishful thinking.” However, it is important that you continue to listen consistently so that these ideas can take hold. Also, by listening to subliminal suggestions, you allow positive affirmations directly into your subconscious. Scientific studies have proven that this is an easy and effective way to overcome mental hurdles and elicit a healthier response from your whole self. Healing Meditations is an empowering two CD set in which Dr. Bernie Siegel guides you through several empowering and healing meditations. These are two nice CDs full of great meditations to help you. Listening to these meditations, can be very helpful in enhancing your immune system and will help you gain a holistic perspective on your health. The meditations will help you to see your uniqueness and beauty and deal with problems such as negative thoughts or stress. 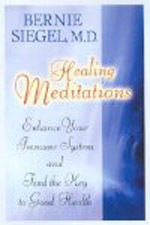 One of the two CDs in this set is Dr. Bernie Siegel's "Meditations for Finding the Key to Good Health." The other CD in this set is called "Meditations for Enhancing Your Immune System." Format / media: 1 CD Audio Length: 1 hour and 1 min. Healing Relationships – Your Relationship to Life and Creation is a helpful, self-healing and relationship-healing sort of meditation series. Throughout the beginning of this CD Bernie speaks to you and explains how much love and kindness can help change your relationships. You are then lead by Bernie through a series of meditations where he helps you to speak your truth and share forgiveness with the world around you. It will also help you to see yourself as a blank canvas that you can create beautiful works of art with. (1 Compact Disc). Every hospitalization, period of convalescence, or visit to a patient can be an opportunity for healing to happen. Since most hospitalizations are sudden and unexpected, few patients and family members are prepared to take advantage of these healing opportunities. Help Me to Heal is a “just-in-time” resource that anyone can pick up and immediately use—to help realize this great healing potential. It provides the empowering tools, strategies, and resources that will enable readers to turn their bedside environment and illness experience into a sacred space and time where healing can occur. When patients, caregivers, and family members are provided with these strategies, they become participants in the healing process—and are then able to communicate their needs to doctors and staff simply and effectively, thereby creating a healing team where everyone is moving in the same direction. "To help you survive and learn from this experience, and to heal afterwards, Help Me to Heal is an invaluable resource." "If you or a loved one have to go through major medical care . . . this book can be . . . life-saving and soul-saving." Inspirational guidance for dealing with anger & pain and fear of recurrent illness. 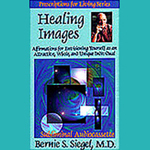 In this compassionate and powerful healing guide, Dr. Bernie Siegel, the author of the triumphant bestsellers Love, Medicine & Miracles and Peace, Love & Healing, provides readers with healthy ways to respond to life’s adversities. How to Live Between Office Visits will show you helpful insights for reaching healing and happiness. The book includes great stories that can help you through life hard challenges and struggles and come out lighter, brighter, and happier. It is full of witty and helpful assertions and anecdotes from Bernie's years of medical practice. If you need or want any help getting through office visits with hope, light and health; or you just want to have a better outlook for life, this is the book for you! It also makes a great gift for a loved one that could use a little help. Humor and Healing is a delightful “house-call” with an empowering message: humor sometimes is the best medicine. It is Dr. Bernie Siegel’s sparkling conversation about the healing power of love and laughter. From how positive thinking helps us lead longer, more productive lives. From how positive thinking helps us lead longer, more productive lives ... to new findings about the healing power of of laughter ... to miracles of spontaneous remission in "terminally ill" patients ... you will find Humor and Healing to be a life-affirming house call from this respected surgeon and speaker. As Dr. Bernie Siegel says: "If you live in your heart, magic happens." This is the essence of his powerful approach to living your life in the present. Each insight about the psychology of illness shared by Dr. Bernie Siegel is supported by a real-life example drawn from his work as a surgeon and teacher. 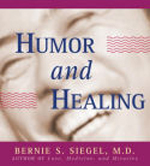 Humor and Healing also includes many stories, told with love and joy as only Dr. Bernie Siegel can, about exceptional patients who have opened to the heart of healing, with unforgettable results. Life, Hope & Healing: Prescriptions for Living from the Heart! Dr. Bernie Siegel has long observed how relationships with animals have helped his patients, alleviating their suffering and heartbreak. Now, he’s gathered many inspiring true stories, including delightful tales from the “Siegel Family Zoo” where “squawks, purrs, chirrups, squeaks, barks, and so on” fill the house. Other stories reveal animals as teachers and messengers, doctors and nurses, healers and miracle workers, and often as guileless clowns. Bernie writes that animals are here to show us how to be nonjudgmental and live better, healthier lives. Let these stories teach you, and apply their lessons to your daily life. 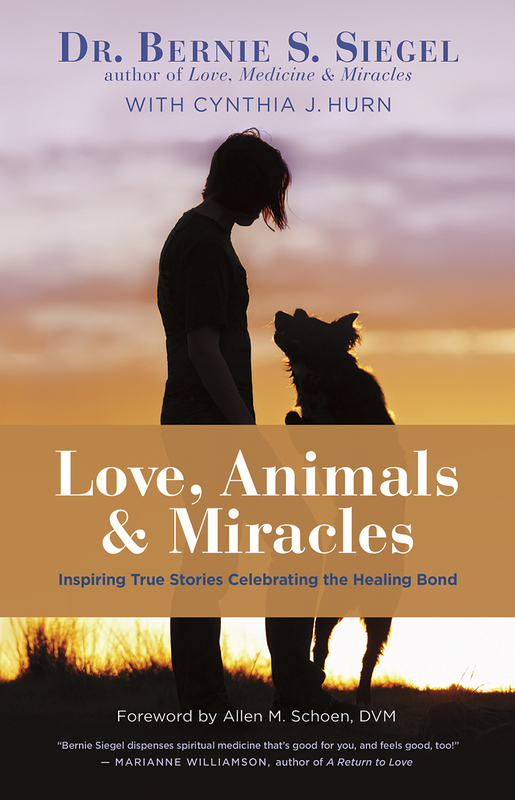 If you have an animal, an appreciation for the inspirational, or simply the need for a smile, you’ll treasure this celebration of animals as a source of love, wisdom, and miracles. A portion of the publisher’s proceeds from this book will aid Ark Angel Society. During his many years working with thousands of patients and their families, Dr. Bernie Siegel became an expert on how to turn sometimes trying situations into opportunities for personal growth. In his newest book, this husband of more than 50 years, father of five children, and grandparent of eight, shares the gems garnered from his practice and his own family life to show readers what he’s learned about raising kids with love, wisdom, and humor. How much time with you do your kids need? How do you teach your children values? When kids misbehave, how do you mix appropriate anger and discipline with love? What are some ways to help children adjust to separation or divorce? Should you get a family pet? With a wealth of quotes, anecdotes, parenting tips, and his comforting, caring, down-to-earth tone, Dr. Siegel addresses the myriad questions that parents face as they strive to guide their kids to happy, healthy adulthood. Delivered with just the right dose of compassion, inspiration, and gentle humor, Love, Magic and Mudpies is an insightful and supportive guide on every aspect of parenting. The guided meditations presented here allow you to see yourself as a healthy, vibrant being who’s in love with life; is communing spiritually with nature; and is learning from those you admire. This life-altering audio program will show you how to take advantage of all the joy available to you, and even how to die laughing! Meditations for Enhancing Your Immune System is a powerful CD in which Dr. Bernie Siegel himself guides you through two individual meditations. Each meditation is a combination of guided imagery and auto-hypnosis to boost your defenses and calm fear. Bernie’s soothing voice guides you to see your unique qualities and inner and outer beauty. These inspiring inner journeys are made to assist you in getting rid of negative thoughts and other problems that can contribute to a lack of physical, mental or spiritual well-being. Remember that it's important to create "healing intervals" throughout your day to receive the maximum benefit from this helpful CD. After listening to this CD and possibly other Bernie Siegel CDs you will feel and notice that old negative patterns will be erased and you will have and use new positive everyday thought patterns and ways of thinking that will benefit you in so many positive ways. 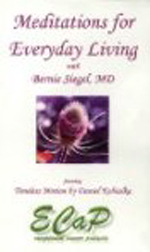 Meditations for Everyday Living with Bernie Siegel, MD. Bernie guides you through meditations that facilitate the process of self-discovery, conflict resolution and healing with the background music of Daniel Kobialka’s Timeless Motion. An ECaP best-seller, recorded live. Dr. Bernie Siegel guides you through two individual and empowering meditations, each a combination of guided imagery and auto-hypnosis. These inspiring inner journeys are designed to assist you in dealing with negative thoughts, past hurts, stress, grief, and other conditions that can contribute to your lack of well-being. Bernie¿s calm, resonant voice gently helps you experience your own unique qualities, as well as your inner and outer beauty. Format / media: CD Audio Length: 52 min. On this audio program geared to help you overcome life’s stresses and strains, Dr. Bernie Siegel guides you through two individual and empowering meditations, each a combination of guided imagery and auto-hypnosis. These inspiring inner journeys are designed to assist you in dealing with negative thoughts, past hurts, stress, grief, and other conditions that can contribute to your lack of well-being. Relax and appreciate your uniqueness! 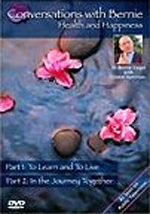 Learn how to rejoice in yourself with these positive meditations of peace, love, joy, and optimism. Meditations for Peace of Mind includes two original and individual meditations with Dr. Bernie Siegel as your guides. These meditations are designed to bring you peace of mind by helping you to deal with negative thoughts, past hurts, stress, grief, and other conditions that can contribute to a currently non-peaceful mind. After dealing with these problems and others in these meditations, you can learn to relax, accept yourself, and appreciate your uniqueness. These two inspiring inner journeys are a combination of guided imagery and auto-hypnosis designed to bring you peace of mind. Originally published nearly ten years ago, Peace, Love & Healing offered the revolutionary message that we have an innate ability to heal ourselves. Now proven by numerous scientific studies, the connection between our minds and our bodies has been increasingly accepted as fact throughout the mainstream medical community. In a new introduction, Dr. Bernie Siegel highlights current research on the relationships among consciousness, psychosocial factors, attitude and immune function. "Highly recommended reading for just about everyone." "Bernie Siegel [is] a doctor who loves. In this age of massive, impersonal medical technology, his advocacy of human caring is a necessity." "I was enthralled with this book. Once into it, I could not stop reading until I had finished . . . It is a truly great book . . . [that] combines sound thought with captivating humor." "The American people are beginning to think in new ways about health and illness . 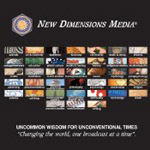 . . Bernie Siegel is helping to define and open up these new frontiers. In this sense he is in the best medical tradition." "For those ready to be uplifted by the soothing repetition of time-tested homilies, Siegel delivers the goods." ". . . another dose of effervescent good feelings and for suggestions about what to do when . . ."
"Bernie Siegel is a brilliant beacon broadcasting a message of hope. When high-tech medicine is supplemented with love and compassion, we have not only curing but also healing, which is what Siegel's message is all about." 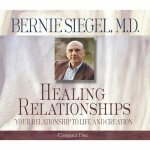 "I regard Bernie Siegel as one of the greatest healers of our time. After having read Prescriptions for Living, I am convinced that reading a few pages of this book everyday will help anyone stay inspired, vital, energetic, and healthy for life." 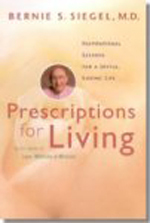 "Prescriptions for Living might also be titled The Gospel According to Bernie. 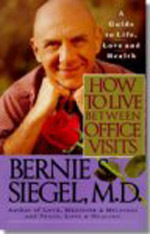 Bernie Siegel's recommendations for living and dying well are wise, witty, and concise -- good medicine all around." For parents who want to help their children learn how difficulties can become blessings. 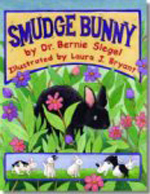 Smudge Bunny is the story of Smudge, Dr. Bernie Siegel’s beloved pet rabbit, and her journey to reach their home and family. In recounting her story, Smudge comes to realize that sometimes the paths in life that look like detours are really just different ways to get to where she was meant to be all along. Written at a child's level with warmth and playfulness, the book is a wonderful gift for animal lovers as well, teaching the true spirit of kinship between humans and their pets. 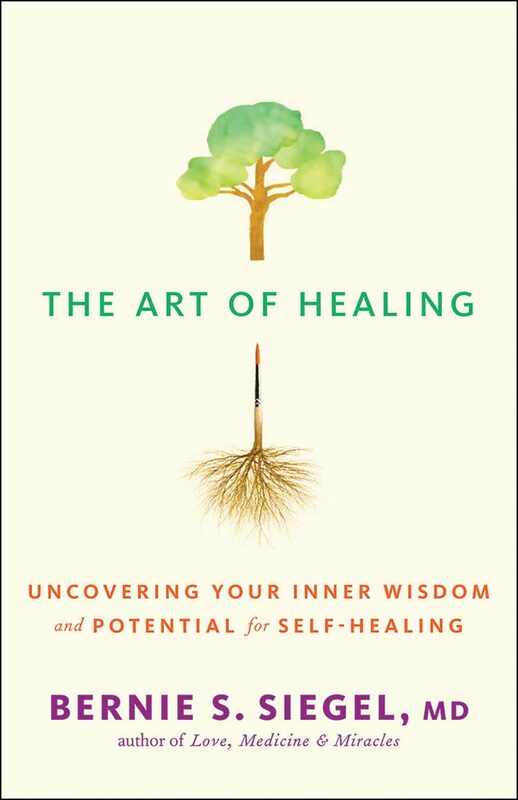 In these pages, renowned medical doctor and spiritual teacher Bernie Siegel demonstrates how science and spirituality interact — and how you can tap your body’s potential to heal. 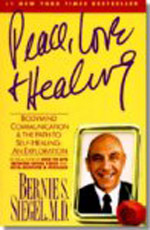 After studying the use of crayon drawings by patients facing life-threatening disease, Bernie founded Exceptional Cancer Patients to facilitate self-induced healings, which were often called miraculous. Bernie realized our bodies actually want to heal, and we can aid this innate propensity through what are currently seen as unconventional practices, including drawing, visualization, dreams, love, and laughter. You’ll learn how to use these practices to help with everything from diagnosing and understanding your illness to making the correct treatment decisions to sharing your experience with loved ones and caregivers. 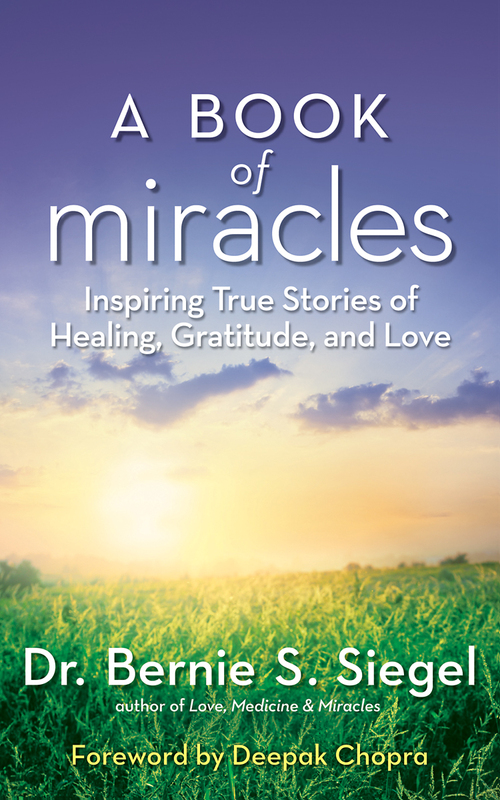 Filled with inspiring true stories and suggestions for traveling your own healing journey, this book offers hands-on, patient-proven techniques that can create miracles. When Dr. Bernie Siegel tells a joke, it’s not only funny – it’s good medicine. 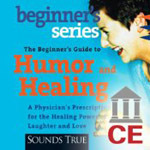 Now this pioneering physician uplifts our hearts and tickles our funny bones with The Beginner’s Guide to Humor and Healing. With a keen balance of hope and realism, Marc Barasch sets out on a journey to the heart of compassion, discovering its power to change who we are and the society we might become. He describes encounters with empathetic apes, as well as with Buddhist monks whose brain scans prove the power of compassion practice; with a man who donated a kidney to a stranger and another who forgave his daughter’s murderer; with teenage Palestinian and Israeli girls trying to wage peace; even with astronomers trying to send a missive to E.T. that we’re not only clever but kind. "I have read this book twice. The first time, coming from an intellectual perspective, I found things to think about. The second time, I stopped thinking and read it from my heart, and was doubly rewarded by the stories and the wisdom Marc shares. I heartily recommend this book to anyone who wants to understand why the compassionate life is the answer--and who wants to learn how to live it." "An argument for compassion that is balanced yet persuasive--and long overdue. This book ought to be a compulsory read for all." "Marc Barasch shares with the best science writers an ability to make you feel the excitement of discovery. His book will interest anyone who struggles to be kinder in a not-so-kind world." "Barasch uses humor and fine reporting...Rather than a whifty compendium of spiritual musings, The Compassionate Life builds upon relevant observations from surprising sources." Marc Ian Barasch is an award-winning writer, editor, and television producer. He is the author of Remarkable Recovery, Healing Dreams and The Healing Path. For more information visit www.compassionatelife.com or visit Marc's foundation at www.greenworld.org. Here is your chance to sit down with Bernie and write! Each of Bernie’s poems is paired with the space for you to express your feelings and thoughts—providing an opportunity for healing & growth … and to laugh a little with Bernie! Marriage & Family is the first book in the Words & Swords Series by Bernie. The series also includes Animals and Nature, and soon to come are Life & Death as well as Self & God. Words & Swords: Marriage & Family can be used before you go to bed; in the middle of the night, when you can't sleep; or in the morning, fresh from dreams... Bernie is up ahead of you. The light is on at his writing desk. Maybe, amazingly, he's been mulling over the very same thing you've been thinking about. Or, if your heart hurts, you feel all locked up inside, and don't know what to think, sit down with Bernie and let him talk to you a while. He will stop and be with you, waiting patiently and listening. Listening with love, free of criticism and advice. Eventually you will even laugh a little together ... the healing and the rebirthing will feel so good. HOW TO USE THESE BOOKS: Before you go to bed; in the middle of the night, when you can't sleep; or in the morning, fresh from dreams… Bernie is up ahead of you. The light is on at his writing desk. Maybe, amazingly, he's been mulling over the very same thing you've been thinking about. Or, if your heart hurts, you feel all locked up inside, and don't know what to think, sit down with Bernie and let him talk to you a while. He will stop and be with you, waiting patiently and listening. Listening with love free of criticism and advice. Eventually you will even laugh a little together … the healing and rebirthing will feel so good. Format / media: 6 x 9 in. Soft cover, hand bound. Greyscale printing. Archival.